Ediacaran: My Grandma, what big teeth you have . . .
My Grandma, what big teeth you have . . .
Teeth are tough. Which was good for palaeontology, because for a while there, they represented the majority of early mammal remains (not any more thankfully). Not only are teeth tough - and so preserve well - they are also quite plastic in terms of shape, and so can be diagnostic for evolutionary purposes, and also for palaeoecological purposes, because the shape of teeth can tell us a lot about what the owner ate. Chiselly front teeth and flat molars suggest a vegetarian diet, while pointy-stabby teeth and slicey-crushy molars indicate a meat-eater (humans have a smorgasbord of different types as befits omnivores - or eat-anything types). This is all very well and good, but what happens when you come across a unique set of munchers? Ones that have been modified beyond all recognition? 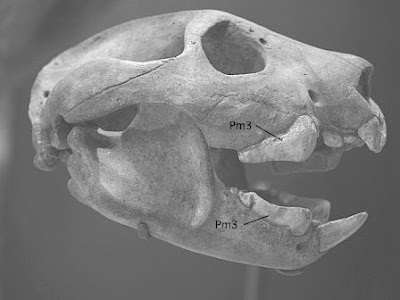 Presenting Thylacoleo carnifax the "marsupial lion"
Check out Premolar 3 (labeled Pm3 in the image). Premolars are teeth with delusions of molarity, but, even so, these are huge! And have a very sharp blade-structure. No other premolar or molar comes close in terms of shape to Thylacoleo's premolar 3. Oh yeah, and see the big canine tooth in front of Pm3 in the lower jaw? Umm . . . that's not a canine. It's a heavily modified incisor (the chisel-like teeth in the front of the jaw). When Richard Owen first described Thylacoleo in 1859, he was in no doubt about what it ate, as the quote above indicates. However, this was questioned at the time, especially as Owen had classified Thylacoleo as a diprotodontid, and all diprotodontids were vegetarian. Indeed, a number of fanciful interpretations of what constituted Thylacoleo's diet followed, including, herbivore, scavenger, soft fruit, cycad pith or the fruit of the Cucurditaceae (that's melons, gourds and cucumbers), even crocodile eggs! More recent studies have favoured a carnivorous diet, relying on dental wear patterns and skeletal structures. But, is there another way to tell? Well, yes (otherwise this was going to be a very short post). Both Strontium and Zinc can be used as an indicator of diet. Sr is discriminated against in the food chain. It is not taken up by vertebrate tissues and organs, but it is taken up in bone, at about 20% of the amount ingested. Plants, however, do preferentially take up Sr, with leaves and other herbaceous vegetation taking up higher levels than grasses. This unequal distribution means that browsing herbivores are exposed to, and thus take up, more Sr than grazing herbivores, and both are exposed to more Sr than carnivores. Zn is the reverse. It is found in blood and tissues, but less in plants, with herbaceous plants having the least. There are some caveats to using this type of analysis. 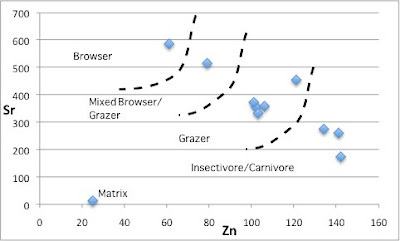 Only bones from the same location can be compared, as background Sr and Zn levels vary from place to place; only adult bones are used (juvenile bones show markedly reduced Sr levels as mammalian milk is very low in Sr); and teeth and rib bones are not used - Sr levels in teeth are not reset with age, and rib bones are metabolically active and could be susceptible to short term resetting (especially during lactation). So that's the theory, but does it work? A number of bones from a variety of adult animals were collected from Henschke Cave at Naracoorte, South Australia (depost 35-40,000 years old). These were the grazers, two kangaroos (Macropus giganteus), a rat kangaroo (Potorous tridoctylus), and a wombat (Vombatus ursinus); the browser, a koala (Phascolarctos cinereus); a ?mixed browser/grazer, a short-faced kangaroo (Sthenurus sp. ), and insectivore/carnivores, a long nosed bandicoot (Perameles gunii), two Tasmanian tigers (Thylacinus sp. ); and of course Thylacoleo carnifex. The koala was clearly differentiated, with the highest Sr and lowest Zn, confirming it's status as a browser. Plotting between the koala and grazers (kangaroos, rat kangaroo, and bettong), was Sthenurus, which was pleasing as it has been interpreted as a mixed feeder, based on its morphology. This analysis supported that interpretation. Within the grazers, the outlier is the wombat. It's higher levels of Sr and Zn may be due to its burrowing lifestyle, where it is exposed to fine dust which could increase its exposure to Sr and Zn. Taking the ratio of Sr to Zn, however, the wombat clusters with the other grazers. The insectivores/carnivores cluser to the right of the graph with low Sr but elevated Zn. All samples had much higher levels of both Sr and Zn than the matrix, so matrix levels were not influencing the results. So, where does Thylacoleo fit? Thylacoleo (in red) plots right in the carnivore end of the spectrum, supporting that it is indeed, a carnivore. This means that Owen was right, and that this is an extraordinarily rare case of a veg-head group producing a carnivore. This is why the teeth are so weird. The 'canine' is formed from an incisor because the group did not have canines. Premolar 3 is weird because the group did not have carnivorous premolars and molars with slicing edges, and so Pm3 had to evolve from an herbivorous premolar. Photo credit - Thylacoleo skull photo from Brian Switek's Laelaps blog. Excellent - fascinating stuff, Chris! Being a Meteorologist and knowing little to nothing about Paleontology, just want to say thanks for doubling my knowledge and eliciting a big WOW at the end of the post.